this weekend, i bumped into someone i knew from law school, who was at least 3 years my junior. after exchanging the usual hello's and how are you's, i very casually asked: "abogado ka na ba?" i never meant the question to be in any way accusatory; its purpose really was to find out exactly what he was doing. besides, i wasn't sure if he had eventually finished law. it was not as if i assumed he got kicked out of UP law, or did not pass the bar. nonetheless, he took no offense to my question, and very humbly confessed: "sa awa ng Diyos, pumasa na rin after my third try." i was very very surprised to hear that reply, not only because it wasn't what i had expected him to say, but also that he sounded very comfortable in admitting it -- there was not a tinge of hesitation. i know previously in an earlier entry i said that i get irritated when people assume that i took the bar more than once, regardless of what they may think about the bar exams, or of people who have taken it at least twice. but the bitter fact is that about 70% of lawyers have taken the bar exams more than once, going by the passing average over the years. i myself have close friends who failed the bar the first time around. heck, i even have a cousin who didn't make it when we both took it in 2002.
i personally get irritated when people assume certain things, but that doesn't mean i have a poor regard for people who may have taken the bar more than once. to be honest, their failure could have been the result of any of a variety of reasons, and luck plays a major role in it: it just isn't possible to study and read everything that's available, so if you've fortunately come across the law or the jurisprudence applicable in a given set of questions, then you're indeed lucky. there's really no scientific way to guess what the bar examiner is going to ask, so you study, study, study, and for all it's worth, also pray a whole lot. incidentally, during my chat with this fellow i knew, he told me that one of the things that may have done him in the first time was his crappy handwriting. it suddenly dawned on me that in my case, it may have been the total opposite: that i passed on the sheer neatness of my penmanship. and i make no excuses about it, nor am i unnecessarily humble when it comes to how nice i write: and i mean that two-pronged. to say that i passed solely because i write beautifully (again, double edged), is of course completely unfair. but it really must have helped a whole lot. since my undergraduate years, i have been told things like you're handwriting should be a font. or how can you write so neatly on an unruled piece of paper? or you write like a girl. that's mainly the reason that it was only in 2004 when i finally began to blog: because i insisted on keeping instead a handwritten journal. i am narcissistic, and i like looking at my own handwriting, munching my own words. but since that journal was lost, i felt devastated and couldn't go back to writing again, hence this blog. 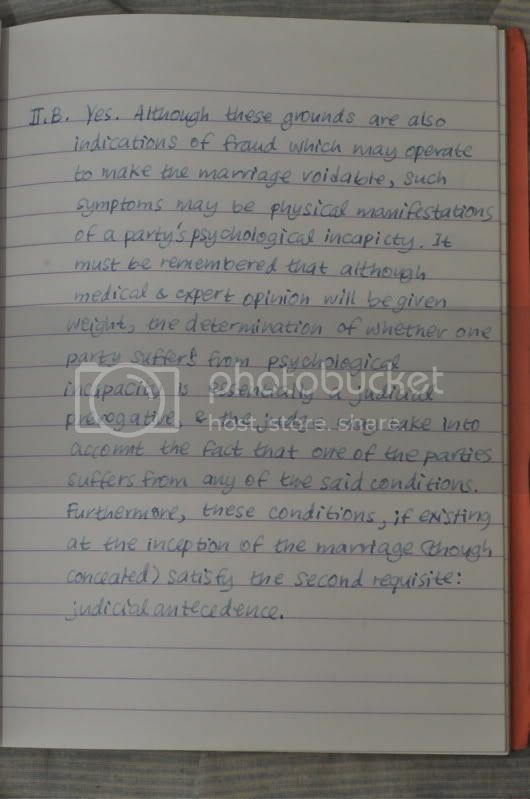 but just to show you what i'm talking about, let me show samples of my handwriting. 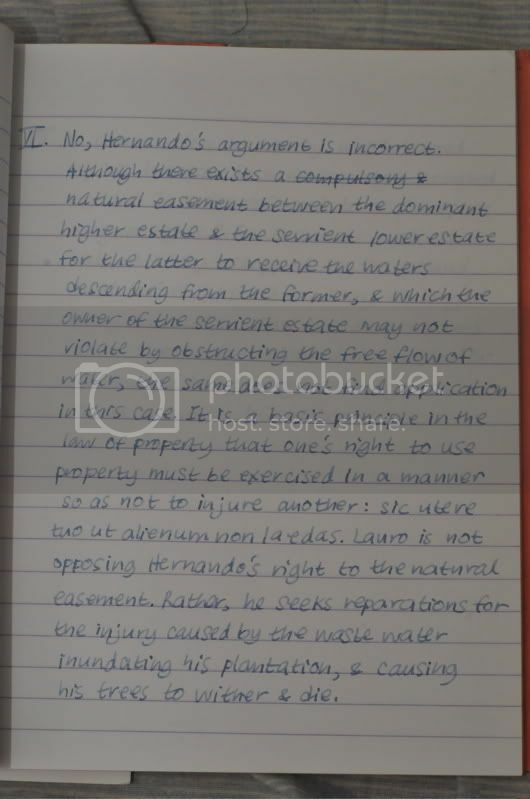 these are actual pages from my civil law exam booklet. even under extreme pressure, i was able to write fluidly, neatly, beautifully. a matter of trivia: bar examinees, successful or otherwise, may request for their examination booklets a few months after the results are released. and for my readers who are also lawyers, never mind the answers. just admire the handwriting. and if anyone disagrees, go write your own blog.